Color Me Style: All-White Summer Inspiration from Olivia Palermo, Kerry Washington, Kristen Stewart, & More! July is almost over, but that doesn’t mean summer is about to end. When it comes to summer fashion, wearing monochromatic white is an effortless, chic, & classic choice for any occasion. White is bright, sleek, light, & easy to pair with neutrals & prints for a luxe look. Get inspired by the celebrities below, including Project Runway judge Heidi Klum, royal fashionista Kate Middleton, model Kendall Jenner, Scandal star Kerry Washington, Café Society actress Kristen Stewart, & designer Nicole Richie. More inspiration for the office, a day out with the girls, & date night comes from beauty queen Olivia Culpo, fashionable force Olivia Palermo, singer Selena Gomez, Burnt actress Sienna Miller, musician Solange Knowles, & pop star Zendaya. In an effort to reach Style Darlings of all shapes & sizes, I’m happy to share some white-on-white inspiration with options of misses, plus, & petites looks because no one should be excluded from wearing what they want. White isn’t always an easy color (or lack of) to pull off (I know I never wear it all together), but I love a crisp white dress & flats, mixed with some sparkly metallic jewelry. Check out the below options to help build an elegant & on-trend all-white outfit to affordably play with for the rest of the summer. SHOP: misses jewel neck dress, plus floral lace dress, petite lace skirt dress @Dress Barn. 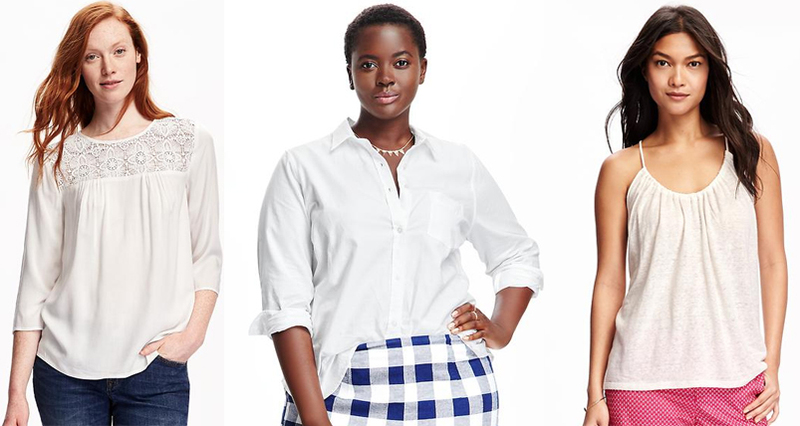 SHOP: misses lace blouse, plus twill shirt, petites tank @Old Navy. SHOP: misses Free People shorts, misses Anne Klein eyelet pants, plus Amanda & Chelsea skirt, plus Amanda & Chelsea pants, petites Vince Camuto lace skirt, & petites NYDJ crop jeans @Nordstrom Rack. 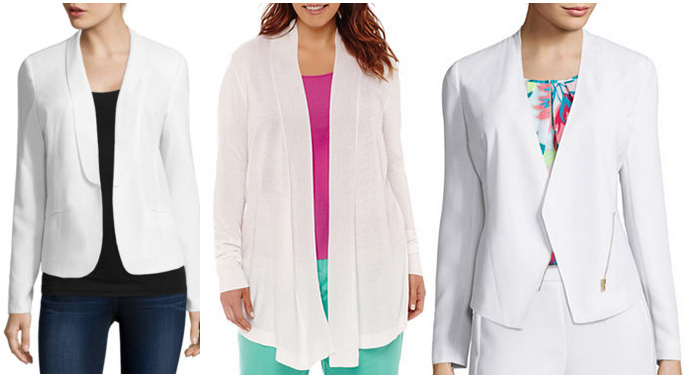 SHOP: misses shawl collar blazer, plus Liz Claiborne open cardigan, & petites Worthington zip jacket @JCPenney. SHOP: Jessica Simpson curtsy pump, Clarks Banoy Tulia sandal, GC lace flat, & G by Guess Daniel flat @DSW. SHOP: Madden Girl perforated tote, Gabrielle Rocha Chiara bucket purse, & Herschel Supply Co. clutch @6PM. 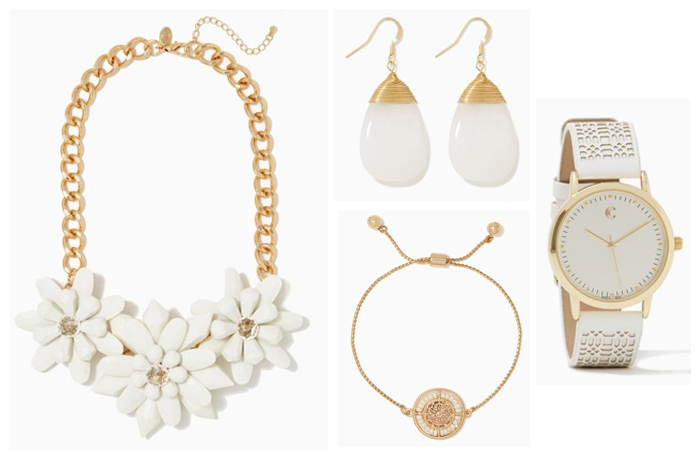 SHOP: floral necklace, teardrop earrings, bracelet, & perforated watch @Charming Charlie. Do you like to wear all white in the summer? Which pieces are your favorites? What color do you most style monochromatically? Which celebrity’s all-white ensemble inspires you? Happy Styling! This entry was posted in Accessories Access, Basics for a Bargain, Color Me Style, Luxury Look-Alikes For Less, Quickie Darling Deal & Steal, Red Carpet Review, Show Me The Shoes, Splurge or Save?, Style Darling Daily and tagged 6pm, Accessories Access, Basics for a Bargain, Charming Charlie, Color Me Style, Dress Barn, DSW, Heidi Klum, JCPenney, Kate Middleton, Kendall Jenner, Kerry Washington, Kristen Stewart, Luxury Look-Alikes for Less, Nicole Richie, Nordstrom Rack, Old Navy, Olivia Culpo, Olivia Palermo, Quickie Darling Deal & Steal, Red Carpet Review, Selena Gomez, Show Me The Shoes, Sienna Miller, Solance Knowles, Splurge or Save?, street style, summer fashion, summer style, white, white accessories, white jewelry, white shoes, Zendaya. Bookmark the permalink.